This page helps you with tips and advice on Teacup Yorkie puppies (babies). Note that these very small dogs are also known as either miniature Yorkshire Terriers, Teacup Yorkshire Terriers, mini Yorkies, micro Yorkies or Toy Yorkies. Everyone loves a puppy, don’t they? The smell and soft fur of a baby dog is distinctive. It is an experience that can have even the most composed person cooing into a tiny furry face. If, however, you have ever raised a puppy you will already know that they need some help to become a happy, nicely behaved and well-rounded adult dog. With toilet training, socialization, general behavior coaching, handling and teething, any new puppy can leave you desperate for his canine maturity to develop. 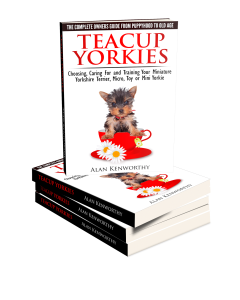 So if you have decided that you would like your new teacup Yorkie to arrive with you as a tiny puppy, then it is important to prepare yourself for how he will learn. You will need to begin his training from the very first day because puppies are learning all the time. The positive point of bringing home a tiny puppy is that you are able to train him from early in his life. 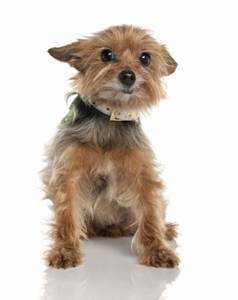 As long as the young Yorkie has been reared so far with his mother and litter mates in a home environment, you have a good place to start training. The well-bred puppy is a blank canvas. The thing to remember, though, is that a puppy is no less of a baby than a young human child. He will be needier than an older dog and will go through stages as he grows, including messing in the house, teething, chewing and adolescence. In all honesty, a tiny Yorkie, just because of his size, is automatically a less problematic puppy than a larger breed of dog. The mini Yorkie is still a puppy, though, and will act like one. I am here to teach you everything that you need to know as a new puppy owner. I will help you to raise a perfect puppy. Come back soon – new sections will include tips and advice on handling constipation, bringing your puppy home for the first time, behavior, diet, life expectancy, growth chart (how big do they get), harnesses, leads, collars and much more! Hi, I Debra Brock is looking for a little tiny teacup yorkie female. If you could please get back with me at 501-757-0372 or debbiebrock195@gmail.com. I am willing to pay between 100.00 to 300.00 an no more I don’t have much money thank you very much. HI,I have been trying to help my friends find a Yorkie to buy or adopt from puppy to five years old no more than five hundred dollars, if any one can help please email me.Thank You Ragan. Hi,I give my tea cup yorkie about a half teaspoon of canned plain pumpkin and you can give daily with the hard food. I have had three yorkies and they weren’t ever given eggs or any other people food . I did give gerber Vienna hot dogs cause there all natural , one 2 times a day.Good luck and constipation in the tea cups is normal. I am very interested in the puppie. Please get back with me at michelletemple@att.net.Thanks.